Since I’ve covered Superman and Batman’s centennial anniversary comics, I thought I’d also do the same for Wonder Woman’s anniversary issues. As her old slogan said, Wonder Woman’s “beautiful as Aphrodite, wise as Athena, swifter than Mercury, stronger than Hercules.” She’s also been prone to a few issue renumberings and various reboots, complicating things below. Diana’s comic debuted in 1942; it ran for 329 issues, ending in 1986. The post-“Crisis on Infinite Earths” reboot by George Perez in 1987 gave Wonder Woman a new #1, and ran for 226 issues until 2006. The book then got a third new #1 in 2006, which ran until 2011, though it reverted to its historical numbering fairly late in its run. After the New 52 reboot, Diana’s series received a fourth #1; it ran for 55 issues, until 2016’s Rebirth revamp. Her book subsequently got a fifth new #1 in 2016. “Wonder Woman” (vol. 1) #100 (August 1958). Art by Ross Andru. 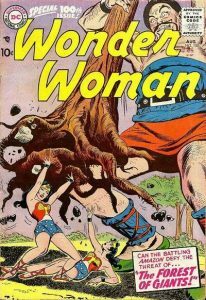 This early Silver Age issue features Wonder Woman fighting giants in another dimension (where she has a counterpart), plus the Amazons trying to record Diana’s 100th adventure for the 100th issue of her comic. This one comes a few issues after the book’s origin retelling and art team change in “Wonder Woman” #98, which is usually deemed the first Silver Age Wonder Woman story. For multiverse fans, WW #98 is also often deemed first appearance of Earth-1’s Wonder Woman. As for her comic, DC Comics exists as a company within the DC Universe. The in-universe DC publishes “true crime”-type adventures of Superman, Batman, Wonder Woman, Flash, etc. (based on news reports, etc.). This got played up in the Flash’s book; Barry was a big Golden Age comic fan. This story appeared late in the powerless “Diana Prince” period of stories. Here, Diana faces off against her occasional foe, Doctor Cyber. Cyber’s the head of a crime syndicate; she uses high-tech battle armor to fight Wonder Woman. The “Diana Prince” period came to an end with issue #203. Issue #204 brought back Wonder Woman’s traditional costume/powers, and also saw the introduction of Nubia. Issue #300 was an extra-sized issue, featuring Wonder Woman, her supporting characters, and fellow Justice Leaguers. There’s also an appearance of Diana’s Earth-2 counterpart. On Earth-2, Wonder Woman married Steve Trevor; the two had a daughter, Lyta Trevor. Lyta herself became a superhero, “the Fury,” named after the Furies of mythology. This issue was the end of a storyline, but it’s more noteworthy as the final issue by artist Mike Deodato. John Byrne took over as writer and artist with the very next issue. “Wonder Woman” #600 (August 2010). Art by George Perez. This issue featured various stories and characters. The guest stars range from Wonder Woman’s friend Etta Candy to foes like Doctor Psycho and Ares. 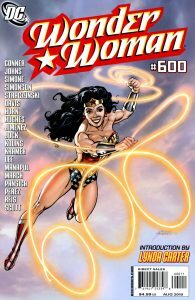 Starting with this issue, “Wonder Woman” resumed its historical numbering (adding together the pre- and post-Crisis series), which it kept until the New 52 reboot in 2011. Like issue #200 above, this special issue features various stories, with a variety of characters. As for the future, I’m not sure what to expect. 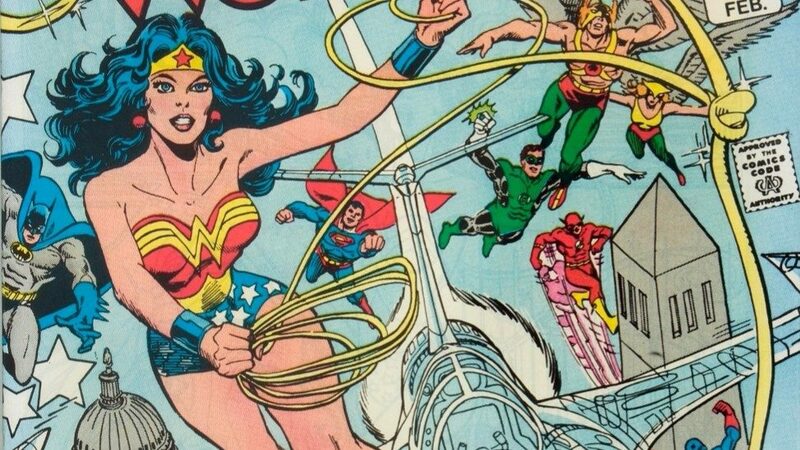 Outside of her creator William Moulton Marston and her post-Crisis writer George Perez, Wonder Woman’s status quo is prone to radically changing depending on DC’s mood and/or who’s writing. Still, anniversary issues do sell, so there’ll certainly be more in the future. Minorities in cartoons: "Goldie Vance"